Here we go again – it’s time for the 4th quarter. Only one week and a handful of games left and the Pacific NW will have crowned all of our High School Football Champions. Each year as we celebrate this finale we see the return of the Coaches from all around the country who are making trips and phone calls to offer the best of the Class. This week every year marks the point in time where recruiting heads into the final quarter and things are heating up- Way Up! Reports are coming in from all over of Coaches making visits at High Schools and making offers as they do. We are also hearing about an exciting round of offers happening and want to report on what we have heard the past few days! Expect things to be pretty wild the next few weeks and if you athletes finished up for the year can get us your very best film we will blast it out to our thousands of followers to help you out! Zion Faaopega- Union HS (WA) DE– We sad he was the best DE in the region and Division 1 talent in August- he remained perhaps the biggest sleeper of the year until last night. Now EWU, who we predicted would offer first, has done so. And he may have the best offer he is going to get. And what a great offer! I still see him in an OSU jersey or WSU Jersey but EWU would be earlier playing time and a place he could flat out SHINE! WAY TO GO ZION! Cole Grossman- Skyview HS (WA) WR – We covered the big time WR a month ago when no offers had found him. Now he has 3 and this last one is a place proven to be an awesome fit for NW boys- WYOMING! The Cowboys love our NW Boys and we love them! Grossman may have the perfect fit here – this is a really special young man right here! 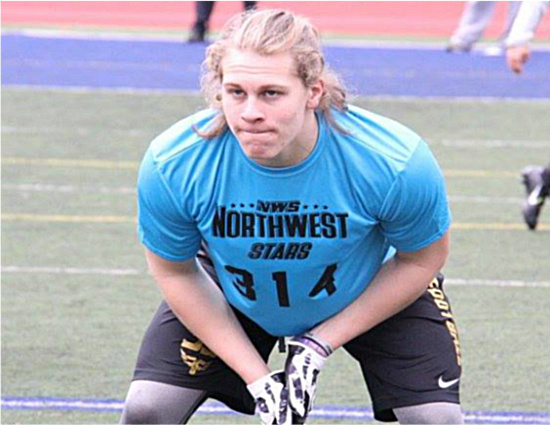 Ben Wilson – Linebacker SUMNER (WA) – WOW WOW WOW! 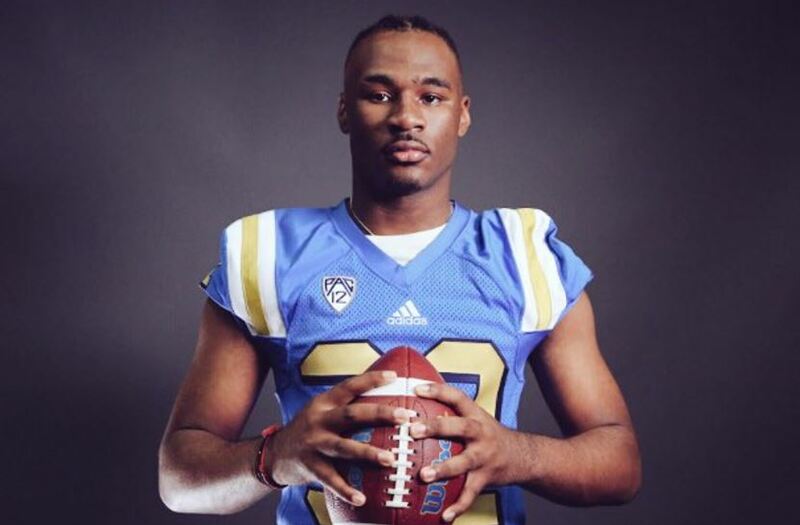 Big Ben is so good- I am going to say this is the best looking Linebacker we have seen come out since Myles Jack (Bellevue- UCLA- NFL) and Joey Alfieri (Jesuit – Stanford). This one man destructive force was/is committed to Texas Christian and he may be best off there. BUT…. Coach Pete and the #PurpleReign came calling and I have to say this may be too good. The UW should build a fence around the State and not let him out. He is a player who can change the course of any game he is in at any level. He is just that good! Carson Shuman – Capital HS – Helena (MT)– We had a chance to see this bruiser from the great State of Montana- the 6’4′- 270 lb linemen is a damn fine one and no doubt he sees the success the linemen up at WSU are having and he is headed there next season! You Coaches need to recruit Montana more- the boys are up there. Spread out in Big Sky country East and West of the Rockies are some damn fine ones. Good luck at WSU next season Carson! 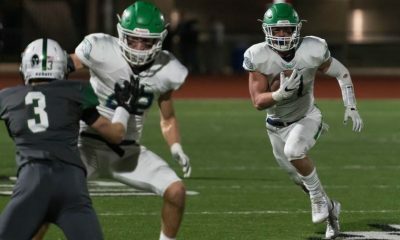 Jaden Sheffey – Woodinville (WA) – QB/ Safety – He has one game left with his Boys for STATE! Win lose or draw this kid is the real deal and we covered him last week. I love him and he can play at any level. 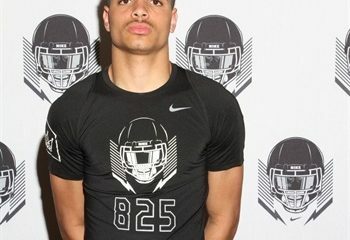 Here is news of his first offer and he will have more! Jake Bailie and Noah Taplett of WHS both have earned offers to play for the Logger too and those guys can play! 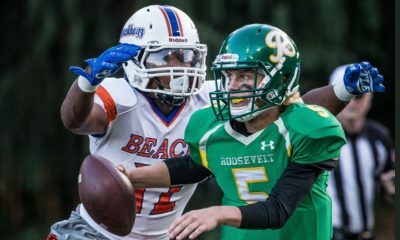 Mosiah Nasili-Liu – Emerald Ridge (WA) – 6’3″- 265 lbs- DE/TE- The Beast – maybe lesser known by many but he did not slip through the radar of the Huskies. This guy is special and will be special. His game film a study in punishment and upfield blocking. Mosiah can play O-line, D-line, TE, and FB. He can move all over the field and is agile like a Cat! He will be a future Husky! Way to go Mosiah! Elijah Winston – Central Catholic (OR) – One of the best in the class of 2018 yet to commit was/is Elijah. This guy is so special and has been a prototype for the sort of star power that comes out of CC. He pulled to trigger and decided to #DoSomething at the University of Oregon! Great job Elijah! He and his brother LaMar will both be Ducks now! Hunter Smith – Bothell (WA) – Big powerful linemen at 6’6″- 275 lbs received a nice offer from Portland State . The Vikings are needing to reload along the line and this guy fits the MO of the sort of player they will be looking for. Congrats to another member of the Blue Train landing offers! Hunter just landed Idaho State last week and has other offers as well. Tommy Togiai – Highland HS (IDAHO)– Tommy is a 4.5 Star – almost a 5 on all National Ranking! The 6’3″- 290 lb defensive linemen is a MONSTER! He is expected to pick between Ohio State, University of Washington, USC and others. He is the #90 overall recruit in the Nation and the #6 DT. He is one to watch as he is taking his time and is so so good! These are a few of them folks – send us yours! Tweet to us and we will send you and your athletes some love! Why not Robbie Patterson QB of South Medford HS? Have you ever seen him play? He’s on hudl, there’s film out there ! It helps to know that he’s got a 3.94 GPA, he’s a leader on and off the field, a three year starter, two year captain, twice SWC first team QB, and Offensive player of the year. I don’t quite understand why there is not one FCS offer on the table. I have so much more to add, if you have questions. Honestly, what does it take ? Hey Rob- I have covered him in the past and know him to be a premier NW QB. People usually send me film and stats and reach out with offers and interest and I am able to reflect that back onto our readers. There is plenty of time yet and I am well aware he and the boys and Coach Singler are going for it all this weekend! Excited to see them get after it! I appreciate the note and will drop in on him very soon! What is your opinion of my grandson Luke Hamper? He switched positions from free safety/slot receiver to middle linebacker this season. First time since his freshman season he played without brace and screws in his knee. Pete- I need to look at his HUDL film now that the season is over. I will do so- good to hear from you!